Some values will resonate with us, and some simply will not. Modes of instruction like test prep, for example, are not going to resonate with the values of schools and districts where authentic student-centered instruction is a value, because the drill-and-kill nature of test prep is simply at odds with authentic teaching. To participate in that is a violation of the values of the school and of the district. How we go about our work matters deeply for how successful we are in introducing effective STEM instruction into our schools. It also matters deeply for how successfully you manage to knit your team together and earn their respect as a leader. In the example here, we can see that the what and the why of everyday instruction must align to our values, or we won’t get very far. 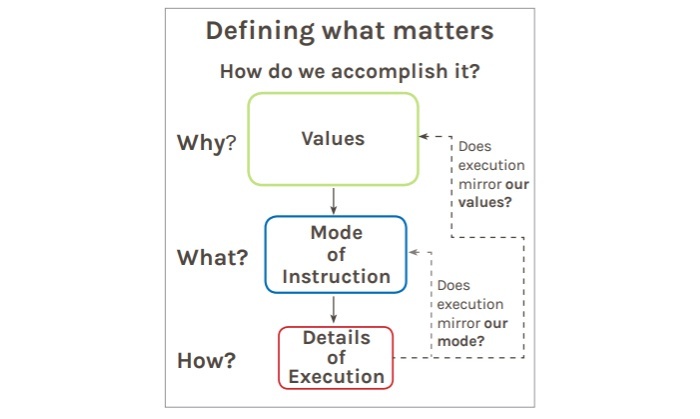 Instead, mode of instruction (the what) must match our values (the why).